All Saints is a real church explorer's church. 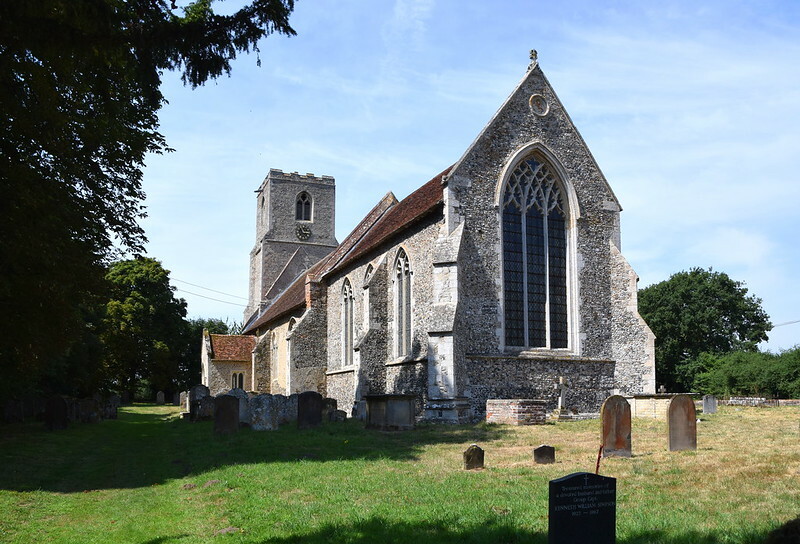 If you like big, rustic, prayerful, ramshackle buildings with plenty of medieval features, a real atmosphere and a sense of being a touchstone down the long generations, then Wilby is bound to please. Amazing, then, to think that it was nearly lost to us. Back in the 1970s, major repairs were needed to the tower. In those days of carelessness in the Church of England, the Rector of the time threw up his hands in despair and applied for a redundancy order. The blessed Lady Harrod, founder of the Norfolk Churches Trust, stormed down from Holt and told him exactly what he could do with his redundancy order. 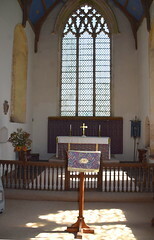 The parish was galvanised, and All Saints survived as a parish church. Consequently, it is still with us today. 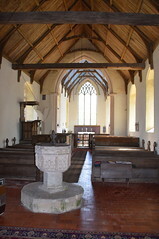 All Saints is a great boat of a church, sailing the fields of south-central Norfolk. There are no aisles, no clerestory, and you can see from the gables quite how thick the thatch must have been. It is an unashamedly Decorated church, putting it at odds with familiar East Anglian Perpendicular. The same is true when you step inside, only it is not the early 14th century which confronts you, but the early 17th. It is almost as if the Victorians never reached Wilby. 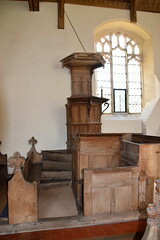 Rustic wooden benches cluster about a double-decker pulpit set against the north wall. 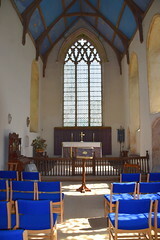 Only a glance into the chancel reminds you that the Oxford Movement did happen after all. A fire in the 1630s gutted the interior, and it was entirely reroofed and refurnished, almost all of which survives today. We see the English Church on the eve of the Commonwealth, as it must have been to an entire generation of Anglicans. 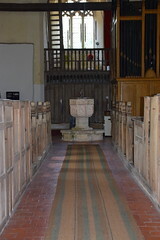 The furnishings, apart from the pulpit, are rendered in a good, local hand. 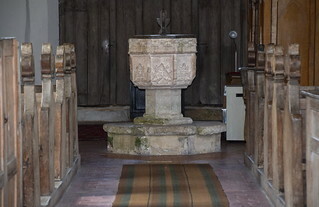 The pulpit is somewhat grander, and must have been brought here from elsewhere, I think, to be incorporated into the double-decker set-up. There is a very curious construction in north-east corner of the nave. What seems to be a flying buttress has been built out of bricks, apparently to support the rood loft stairway. I have never seen anything like it. Apparently, it was built in the 19th century by a pupil of Pugin, and Pugin scholars come all the way to Wilby just to look at it. 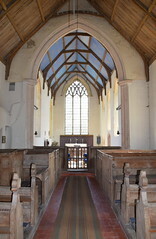 The chancel, inevitably, appears grander, although it must be said that the Victorians restored its medieval integrity with the lightest of touches. A curiosity is that there appear to be no less than three aumbries in the north sanctuary wall. Even odder, the most westerly of them seems to have a chimney - an opening inside goes up through the wall. There are medieval survivals, of course. 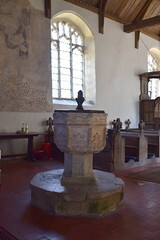 The font is lovely, with richly flowing tracery. There is part of a St Christopher surviving on the north wall, the lower part still bearing the pit marks made by the plasterer who covered it over. 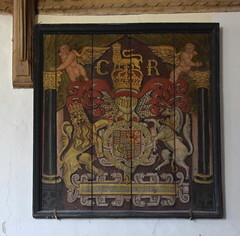 On the other side of the Reformation divide are the Charles I royal arms, almost certainly the ones installed here after the fire, and the tower screen, which is dated 1637. Contemporary with them is something quite unusual, a carved stone pair of arms set inside the largest pew on the south side. 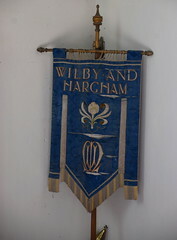 We are used to seeing hatchments, but here is something else again. Was one of them to the Wilton family, who are commemorated on ledger stones in the aisle? Were they set there to commemorate those who oversaw the reconstruction?